I can scarcely say how much of an influence “Star Trek” has been on my life, and how much of that ties into Leonard Nimoy’s performance as Spock. He goes beyond playing the definitive template of a Vulcan, or acting as the conscience of “Star Trek” (both behind the camera and in front of it); Nimoy also acted as an example of how to be a fully-realized person and professional outside of his most famous role. Film-acting, stage-acting, TV-acting, directing, music, poetry, photography, novels, even music videos. There was little the man did not do, and little he did not excel at. While my sadness over his passing is due to the large influence he has been over my life, that sadness is tempered knowing what a rich and full life he had led (Eighty-three isn’t a bad time to go), and the out-pouring of love from those who feel similar to how I do. 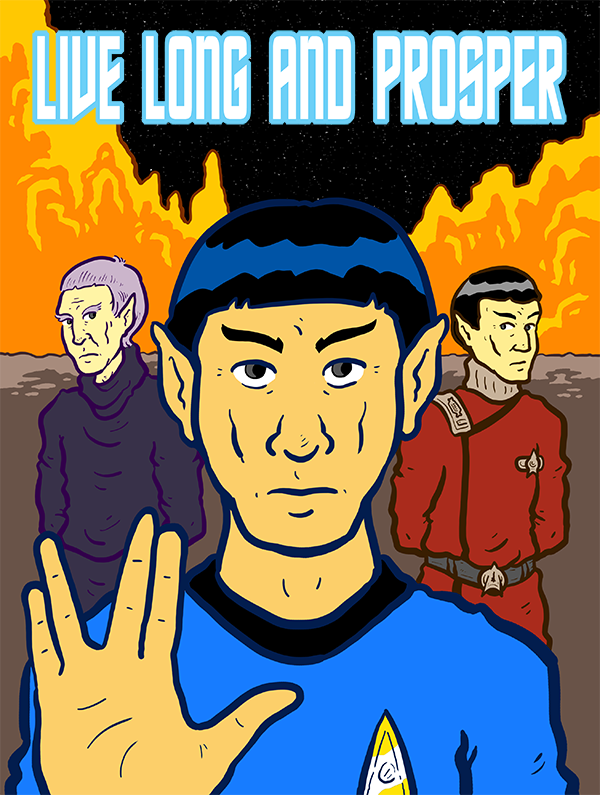 I leave you now with a tribute from the great SFDebris, who sums up Spock’s impact better than my tribute image ever could. Live long and prosper, my friends.